If you’re running an online store (or looking to start one), you can’t go wrong with WordPress and WooCommerce. WordPress enables you to create a customized website easily, while WooCommerce turns it into a fully-featured storefront. If you want to build a truly successful store, however, you may need some extra features. A WooCommerce order form plugin can take your WooCommerce site to the next level. It enables customers to view all the most pertinent information about your products at once, in a simple and streamlined fashion. They can then compare and sort though the available options, and make their selections without leaving the page. In this post, we’ll discuss how WooCommerce one page order form plugins work, why they’re so beneficial, and what kinds of stores they’re most suited to. 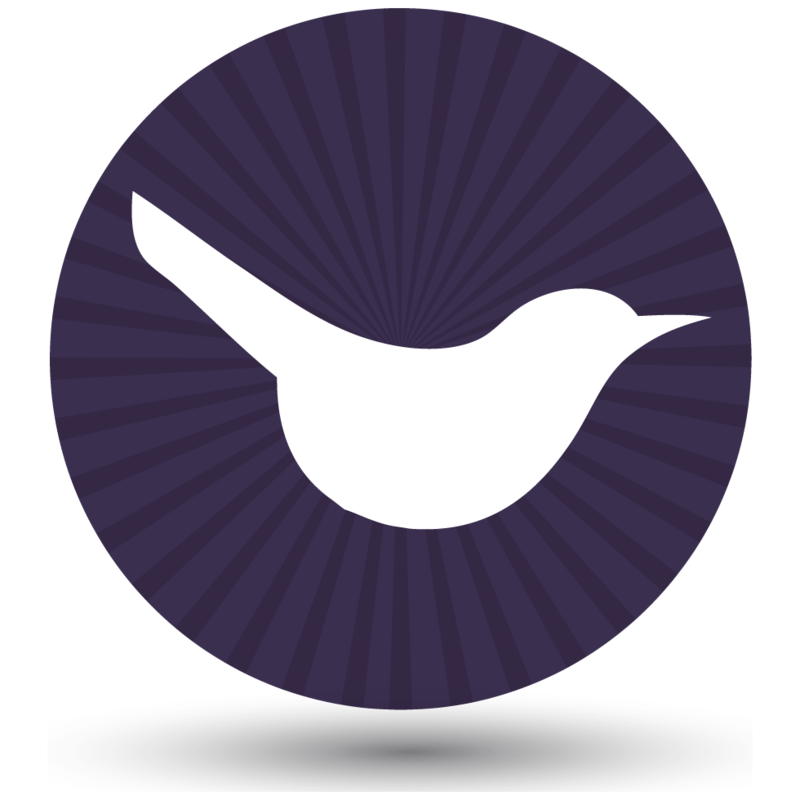 Then we’ll talk about how to create one easily, using the WooCommerce Product Table plugin. Let’s take a look! Create an order form plugin for your WooCommerce store today! Most WooCommerce stores work in a very similar way. Customers can search for products, and then visit individual pages to find out more about each one. To choose quantities and variations and add items to the cart, they’ll need to visit those dedicated pages. For some stores, this method can be sufficient. However, there is a way to make the customer’s shopping experience better and more streamlined. To do that, you’ll simply need to add a one page order form plugin to your website. The WC order form layout lists each product in your store (or whatever selection of items you want) on a separate line in an organized table. This table is made up of columns displaying the most important information about your products. That might include descriptions, prices, categories, variations, and even featured product images. Finally, Add to Cart buttons enable customers to make purchases right from the order form. From this description, you can probably begin to imagine how a one page order form benefits your Woo store. Let’s discuss the advantages in more detail. Since the ultimate goal of your WordPress site is to sell products, every feature you add should contribute to increasing sales. That’s exactly what a WooCommerce one page order form plugin is designed to do. By adding one to your store, you can drive sales by improving the customer experience and making products easier to find and buy. It displays your offerings in one convenient location, so customers don’t need to visit multiple pages or scroll through a lot of search results. You can fit a lot of information and products efficiently into a small space. 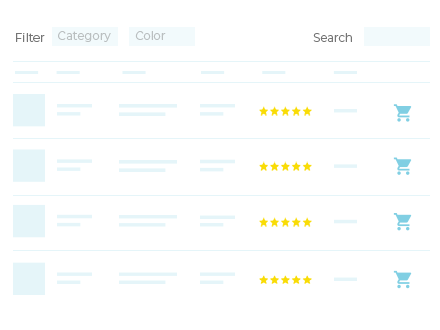 Customers can use filters and similar features to sort through products, compare them, and find the ones they want quickly. You can display quantity pickers and product variations directly in the one page order form. Customers can buy without having to click elsewhere. It’s simple for customers to add multiple products to their cart from one place. That last benefit is particularly important. When you can make the buying process faster and simpler for your customers, you remove potential barriers that might prevent them from completing purchases. This is a smart way to increase sales. What’s more, most customers prefer to buy everything they require at once, and want to avoid the need to make multiple purchases or visit lots of pages. A WooCommerce one page order form helps them do just that. You can use a one page order from in many creative ways, such as to set up a restaurant ordering system. As you can see from the advantages listed above, there are a lot of reasons to use a one page order form. This is a feature that is useful on a wide range of WP sites. Like any feature, however, it’s particularly beneficial in specific situations. Think about the type of store you’re running and whether it will benefit from a WooCommerce one page order form. Stores with hundreds or thousands of products, which need a way to showcase items efficiently and conserve space. Sites that sell a lot of very similar items, since customers will need a method for comparing them easily. Shops where customers are likely to purchase many different items at once or buy products in bulk (such as wholesale sites). Delivery-based businesses like restaurants, where customers expect to make their selections on a single page. If any of these apply to your own Woo store, you’ll find a one page order form immensely valuable. Once you’ve decided to implement this feature on your WP site, all that’s left to do is find the right tool. WooCommerce is an excellent plugin, and offers a lot of vital features for your online store. However, it doesn’t include native functionality that enables you to add a one page order form to your site. While you could build one using custom code, this would be a time-consuming and inefficient approach. This plugin helps you create a WooCommerce one page order form, add it to any page or post on your site, and customize it as you see fit. You can easily tweak exactly what information is displayed and how. What’s more, it’s designed from the ground up to work perfectly alongside WooCommerce. Lets you list all your store’s products, or limit your order form to specific types and categories of products. Provides searching and sorting capabilities, making your product table interactive. Enables you to add various filters to your order form, so customers can sort through the table looking for items with specific attributes. Makes it simple to display product variations, such as different colors and sizes. Supports custom taxonomies and custom fields, so you can customize your order form to meet your precise needs. Helps customers make purchases easily, with Add to Cart buttons and multi-select checkboxes. Includes the option to add images to your order form, as well as audio and video files. 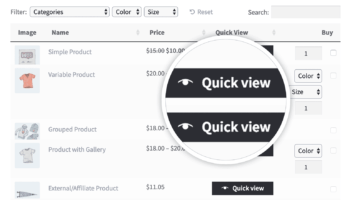 Use WooCommerce Product Table with its sister plugin, WooCommerce Quick View Pro, to show extra product information in stylish quick view lightboxes. It’s worth highlighting the fact that this plugin enables customers to select variations and choose product quantities right on the order form. This differs from more traditional store layouts, which might include an Add to Cart button on the main shop and category pages, but still require customers to click through to the individual product pages to customize their orders. There are even two different ways to display variations, to suit a wider variety of store types. Despite these many options, WooCommerce Product Table is also beginner-friendly and simple to use. If you ever need help, however, there’s plenty of comprehensive documentation to answer your questions. Plus, you can get reliable support whenever you need it. To see what this plugin looks like in action, you can also check out its dedicated demo page. Visit the WooCommerce Product Table demo! As we mentioned above, creating a one page order form using WooCommerce Product Table is quick and easy. You’ll first need to install and activate the plugin itself, of course. Then you can build and customize your order form using its various settings. To get you started, this video will walk you through the process of setting up a WooCommerce one page order form. You can also read full setup instructions in our full order form tutorial. This tutorial demonstrates several ways to customize how your order form appears and what information it contains. It’s worth noting, however, that there are many more tweaks you can make to your WooCommerce one page order form. You can check out the full range of options in the plugin’s documentation, and find instructions on how to implement each available feature. In many cases, it’s best to start by disabling the links within your table that lead to each item’s individual product page. After all, everything customers will need to make a buying decision is already included in your WooCommerce one page order form. This means there’s no need for them to click away (and miss seeing everything else you have to offer). We strongly urge you to take a look through all of WooCommerce Product Table’s options. You can then select the ones that are best suited to your unique store. No matter what kind of WooCommerce shop you’re running, you can create an order form that does exactly what you need. A WooCommerce one page order form is a must-have feature for stores that offer thousands of items, sell lots of simple or very similar products, or simply want to streamline the buying process. Fortunately, adding this option to your WooCommerce store couldn’t be simpler. 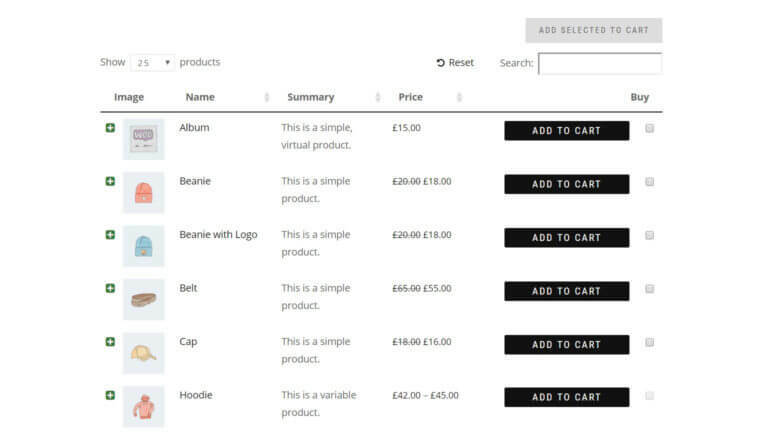 The WooCommerce Product Table plugin makes creating a one page order form easy. You can keep it simple, or customize its appearance, layout, and functionality in a wide variety of ways. Once your new order form is up and running, it will make purchasing your products much more convenient. This benefits both you and your customers. Do you have any questions about how to create a one page order form using WooCommerce Product Table? Let us know in the comments section below!